India launched its 40th communications satellite to provide communication services to the country’s mainland and islands. According to a press statement by the Indian Space Research Organisation (ISRO), the GSAT-31 satellite was successfully launched from the Spaceport in French Guiana, on 6 February. The GSAT-31 is India’s latest geostationary communications satellite. It is positioned at a longitude of 48° East. The GSAT-31 is configured on ISRO’s enhanced I-2K bus structure to provide communications services from geostationary orbit in Ku-band (the portion of the electromagnetic spectrum in the microwave range of frequencies from 12 to 18 Gigahertz), for over 15 years. 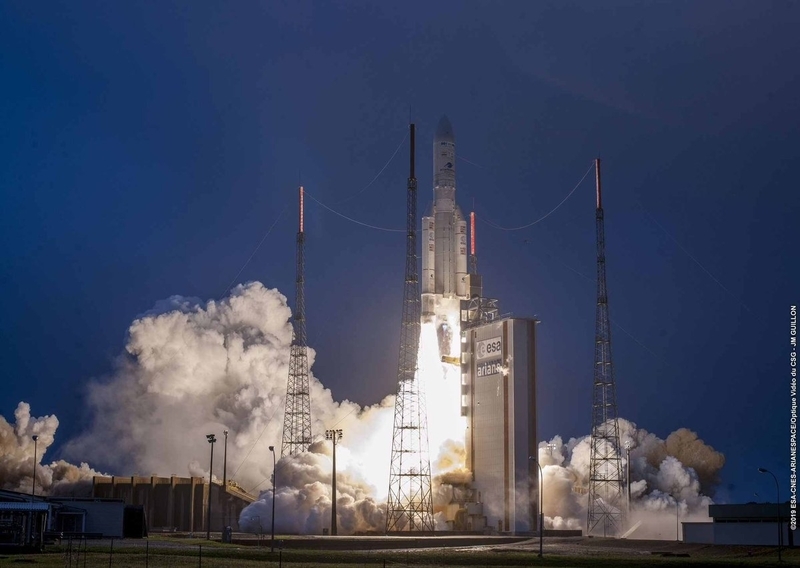 With a lift-off mass of 2,536 Kilograms, the launch vehicle Ariane 5 VA-247 was launched from the Kourou Launch Base, located in the North-Eastern coast of South America. Flight VA247 was the first of 2019 that followed a year that marked 11 missions across the Arianespace fleet. As scheduled, along with India’s GSAT-31, it was carrying the Saudi Geostationary Satellite 1/HellasSat 4, also called HS-4/SGS-1. It is a dual payload condosat for KACST (King Abdulaziz City for Science and Technology– Saudi Arabia) and Hellas Sat (Greece – Cyprus). A condosat is a satellite that supports separate operator payloads on the same spacecraft bus. The Hellas Sat 4 is a Greek geostationary communications satellite owned by Arabsat. It will offer advanced Ku-band regional beam communications services for Hellas Sat, an Arabsat subsidiary. The Saudi Geostationary Satellite 1 communications will offer advanced Ka-band spot beam communications services for the Kingdom of Saudi Arabia’s KACST (King Abdulaziz City for Science and Technology), which includes secure communications for the Gulf Cooperative Council region. ISRO’s Chairman said that the GSAT-31 is uniquely configured to provide flexible frequency segments and coverage. It is expected to provide communication services to the India’s mainland and islands. The satellite will support direct-to-home (DTH) television services, connectivity to Very Small Aperture Terminals (VSATs) for ATMs, stock-exchange, digital satellite news gathering (DSNG), and e-governance applications. It is designed to transfer bulk data for a variety of emerging telecommunication applications. The satellite will also provide wide-range coverage to facilitate communication over large oceanic regions that include parts of the Arabian Sea, the Bay of Bengal, and the Indian Ocean, through a wide-band transponder. After a 42-minute flight, the GSAT-31 separated from the Ariane-5 upper stage in an elliptical geosynchronous transfer orbit (GTO) with a perigee (nearest point to Earth) of 250 Kilometre and an apogee (farthest point to Earth) of 35,850 Kilometre inclined at an angle of 3.0° to the equator. Following the separation, two solar arrays of the GSAT-31 were automatically deployed in quick succession. ISRO’s Master Control Facility at Hassan in Karnataka took over the command and control of the GSAT-31. The release said that in the days ahead, scientists will conduct phase-wise orbit-raising manoeuvres to place the satellite in geostationary orbit (36,000 Kilometres above the equator) using its onboard propulsion system. During the final stages of its orbit raising operations, the antenna reflector of the GSAT-31 will be deployed. After this, the satellite will be put in its final orbital configuration and will be operational after the successful completion of all in-orbit tests.